HARARE, Zimbabwe (AP) — Zimbabwe’s President Emmerson Mnangagwa arrived in Harare late Monday after cutting short his fund-raising trip in order to address the country’s economic crisis and crackdown. Mnangagwa was welcomed at Harare International Airport by Vice President Constantino Chiwenga, former army commander who was in charge during the president’s week-long absence and when the government launched a widespread clampdown in which 12 people were killed, more shot by troops and others dragged from their homes and beaten, according to human rights groups. Mnangagwa hugged Chiwenga and chatted with him on the runway for 15 minutes. The president then told state broadcasting that his trip to Russia and Kazakhstan was fruitful and will benefit Zimbabwe in the long run. During his trip Mnangagwa met with Russian President Vladimir Putin and asked him for a loan. Earlier Monday the government intensified its crackdown on dissent by charging the leader of the country’s largest labor organization with subversion, as the courts ruled that the shutdown of the internet was illegal. Zimbabwe police arrested Japhet Moyo, secretary general of the Zimbabwe Congress of Trade Unions, and charged him with subversion for his role in organizing last week’s national strike. The arrest and Mnangagwa’s return come after a week of turmoil. During the strike, some people went onto the streets to protest the government’s drastic increase in fuel prices. The government said the demonstrations degenerated into riots, prompting it to launch a sweeping wave of repression. Security forces opened fire on crowds, wounding many bystanders, and went house to house in some neighborhoods, beating up many men, according to witnesses. The government also imposed an internet blackout across the country. On Monday Zimbabwe’s High Court ordered the government to restore full internet to the country. The shutdown of the internet was illegal because the Minister of State for Security, who ordered the internet closure, does not have powers to issue such a directive, said the court ruling. Only President Emmerson Mnangagwa has the authority to make such an order, said the court. Over the weekend the government restored partial internet access, but kept a blackout on social media apps like Facebook, Whatsapp and Twitter. 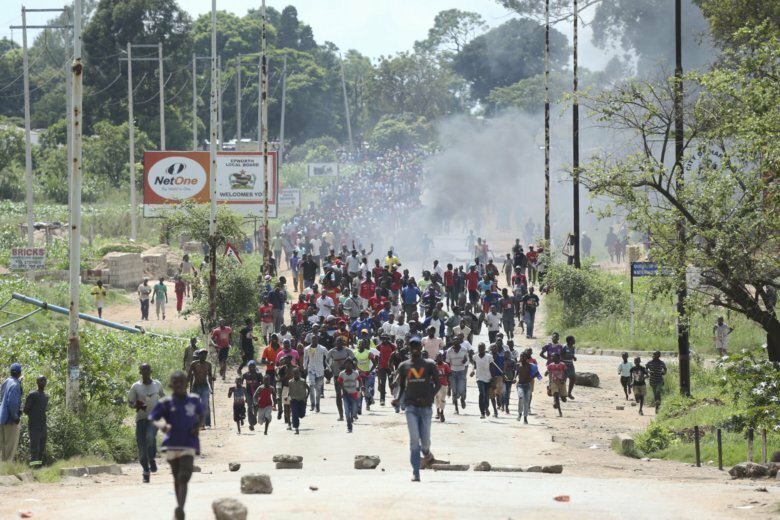 The government alleges the internet has been used to organize violent demonstrations. Zimbabwe’s capital gingerly recovered from the week of tumult Monday. Most shops and businesses reopened, although many people are stocking up on food items in case of further unrest. Indicating the severity of Zimbabwe’s economic problems, South Africa confirmed that it turned down Mnangagwa’s request for a loan of $1.2 billion recently. “We just don’t have that kind of money,” South African treasury spokesman Jabulani Sikhakhane told the broadcaster, eNCA. Activist and pastor Evan Mawarire has been jailed since Wednesday and has been charged with subversion against the government for which he faces 20 years in jail if convicted. Mawarire had used social media to support peaceful protests against the fuel price increases. The case against Mawarire is a “travesty of justice” said his lawyer, Beatrice Mtetwa. His application to be released on bail will be heard on Jan. 23. In the widespread crackdown, about two-thirds of the more than 600 people who were arrested have been denied bail, said Mtetwa. At Davos, he planned to appeal for foreign investment and loans, but the visit had been expected to be a challenge. His Davos visit a year ago came shortly after he took over from longtime, repressive leader Robert Mugabe, a move cheered by Zimbabweans and the international community. But Mnangagwa has faced a year of troubles in which his administration failed to improve the collapsed economy, narrowly won a disputed election and violently put down anti-government protests.